The F-4 Phantom is a fighter bomber initially developed for the US Navy. The US Marine Corps used the F-4 as a ground-support bomber. The Phantom was retired from the service of the US defence forces in 1996. U.S. Navy photo courtesy of Gary Rice. The British variant of the Phantom was fitted with Rolls-Royce Spey turbofans engines. Mitsubishi built 138 F-4 aircraft for Japan. A Turkish Air Force F-4 Phantom, Syria shot down an F-4 of Turkey in June 2012. The F-4 Phantom (previously called the F-4 Phantom II) is a fighter bomber developed by McDonnell Douglas. The supersonic aircraft can travel at double the speed of sound (Mach 2.2). Originally built for the US Navy, the ‘Phabulous Phantom’ took off on its maiden flight on 27 May 1958 and entered into service in 1961. The F-4 has set 16 records for speed, altitude and time-to-climb. It established the world altitude record at 98,556ft in 1959 and speed record at 1,604mph on a 15-mile circuit in 1961. Though developed for the US Navy, the F-4 was used by both the US Air Force and the Marine Corps. The aircraft has been in service in 11 other countries including: Australia, Egypt, Germany, Greece, Iran, Israel, Japan, South Korea, Spain, Turkey and the UK. The F-4s participated in the Vietnam War and the Operation Desert Storm. Production was stopped in 1985, after 5,195 Phantom IIs had been manufactured. As many as 4,138 aircraft were operational with US defence forces, while 919 were sold to various countries. Japan manufactured 138 aircraft. The US retired the Phantom in 1996, but the aircraft is expected to continue its in service in other countries until 2015. "On 22 June 2012, Syria shot down a Turkish RF-4E (F-4) after the aircraft allegedly intruded into the country’s airspace." On 22 June 2012, Syria shot down a Turkish RF-4E (F-4) after the aircraft allegedly intruded into the country’s airspace. Turkey has maintained that the fighter aircraft was within international airspace and was on an unarmed training mission. The aircraft was downed in the Mediterranean and both the pilots onboard were reported as missing. Turkey has sought Nato intervention, citing a threat to its national security. The US Navy initially used the Phantom as an interceptor, while the Marine Corps used the aircraft as a ground-support bomber. The aircraft can also undertake air superiority missions, close air support, interception, air defence suppression, long-range strike, fleet defence and attack and reconnaissance missions. The all-weather aircraft can also be pressed into service for short training missions or exercises in search of anti-aircraft defence systems. The F-5 Tiger II, a single-seat twin-engine supersonic fighter aircraft, was developed by Northrop Grumman, US. The preliminary design of the Phantom II as a single-seat aircraft was developed in 1953. The design was, however, modified into both single and double-seats models. The US Navy selected the two-seat model. McDonnell received a letter of intent from the US Navy in October 1954, for two prototypes and one static test aircraft. Detailed specifications, which were signed in 1955, required the primary mission of the Phantom to be all-weather fleet air defence. Its attack capability was also retained. The first prototype, F4H-1, took off on its maiden flight from Lambert St. Louis International Airport in May 1958. The aircraft was named the F-4 Phantom II, as a tribute to FH-1 Phantom, the first jet fighter of McDonnell. It subsequently became F-4 Phantom as it was the only Phantom in service. The US Navy awarded a limited production contract to McDonnell in December 1958. The first Phantom was inducted into service in 1961. The first international contract (with the UK) was signed in September 1964. The two-seat Phantom is 58.3ft long and 16.6ft high. It has a wing span of 38.5ft. The aircraft weighs 55,597lb (25,200kg) and its maximum takeoff weight is 60,000lb (27,000kg). The maximum speed of the fighter is 1,485mph (2,309kmph), with a range of 1,750 miles (2,816km). It has an initial climb rate of more than 41,000ft/min. The service ceiling is 56,100ft. The F-4 Phantom runs on two 17,900lb-thrust J79-GE-17 jet engines manufactured by General Electric. The Phantom has nine external hardpoints with the capacity to carry up to 15,983lb (7,250kg) of payload (weapons). The aircraft is equipped to carry air-to-air and air-to-ground missiles, as well as unguided, guided and nuclear bombs. There is also an internal 20mm nose-mounted M-61 ‘Vulcan’ cannon. 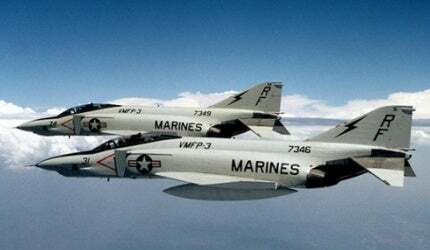 The US Navy and the US Marine Corps used the variants F-4A, B, J, N and S. The F-4N was an upgrade of the F-4B while the F-4S was upgraded from the F-4J. "Though developed for the US Navy, the F-4 was used by both the US Air Force and the Marine Corps." The F-110 Spectre, F-4C, D and E are the variants for the US Air Force. The internal M61 Vulcan cannon was introduced in F-4E. The F-4G Wild Weasel V was an upgrade of F-4E and has the ability to carry anti-radiation missiles. The F-4K and M variants, developed for the British Army, have Rolls-Royce Spey turbofans engines. The F-4EJ is the licensed variant built by Mitsubishi for Japan; 138 aircraft were built by the company. The F-4F is the simplified variant of F-4E exported to Germany. The QF-4B, E, G, N and S were converted into remote-controlled target drones for use in research. The RF-4B, C, and E are tactical reconnaissance variants. The F-4s have undergone various upgrades over the years to suit the requirements of the user countries.